SolarBond® InFrame helps manufacturer's meets growing demand for solar modules while minimizing waste and related costs. SolarBond® InFrame is applied warm in a continuous motion, ensuring both accuracy and high bonding strength immediately after contact with the glass, backsheet and frame. This eliminates the setting time needed for silicone products to cure by offering the instant adhesion of frame tapes coupled with a highly automated application process, shortening production cycles, reducing product waste and minimizing the associated production costs. Additionally, the precision application eliminates the cleaning labour and costs incurred by the runoff cause by silicone sealants. The foamed material fills the aluminium channel in the frame completely, even in the corners, eliminating the risk of water collecting in the frame as experienced with tape solutions. What results is a strong, long-term, weather-resistant bond for a durable final product. 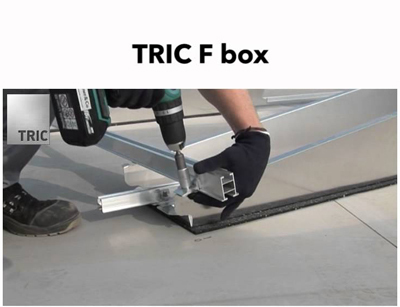 Used with Saint-Gobain Solar's patented single-piece frame, it also reduces the number of corner keys required for framing the module, using just one instead of four as required for both, tapes and silicones, further reducing module costs. SolarBond® InFrame is the first of its kind to combine the pumpable application of liquid silicone with the instant adhesion of tapes in such a unique automated application. PowerShield® Cool Black is a backsheet that helps reduce solar panel operating temperature by using an innovative and proprietary technology that reflects solar radiation. When panels operate at lower temperatures, their electrical components are able to operate more effectively and generate more power. Heat reduction is a key factor in improving solar panel efficiency, and black panels are especially susceptible to increased temperatures. Honeywell's innovative product, PowerShield® Cool Black, can help keep black panels cool while making them more efficient, durable and able to blend in with their surroundings." Independent industry and university laboratory tests have shown that, during periods of peak power demand, solar panels using PowerShield® Cool Black are as much as 7 degrees Celsius (12.6 degrees Fahrenheit) cooler, which can increase their power output by 2 to 3 %. 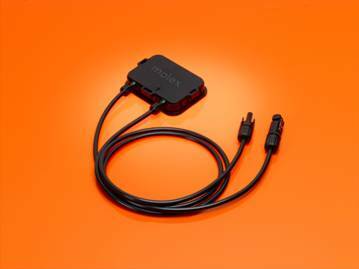 In turn, this increased power output can reduce a panel's cost-per-watt generated by 2 to 3 %. PowerShield® Cool Black's efficiency benefits can help panel manufacturers achieve industry standards for power output at a lower cost. Panels using the backsheet can meet a building-integrated PV (BIPV) or building-applied PV (BAPV) module output rating with lower-cost cells, or reach a higher module output rating using existing cells. PowerShield® Cool Black includes Honeywell's proprietary adhesive, which helps make panels more durable and able to withstand harsh environments. The backsheet has been shown to withstand more than 3,000 hours of exposure at an 85°C (185°F) temperature and 85 % relative humidity while maintaining its structural integrity. PowerShield® Cool Black offers excellent resistance to environmental degradation from sunlight, heat, cold and humidity; strong resistance to acids, bases, solvents, salts and other chemicals; and resistance to excessive moisture infiltration within a module. 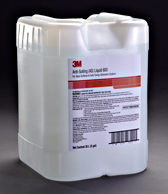 3M introduced a coating for photovoltaic (PV) modules and concentrated solar power (CSP) mirrors Anti-Soiling Liquid is an easy-to-apply coating designed for aftermarket use that helps solar modules stay cleaner, longer. 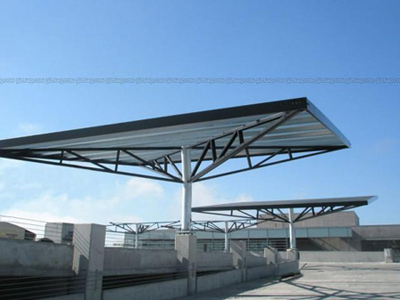 The product significantly reduces dry dust accumulation that often occurs on sun-facing surfaces. This helps increase light transmission to the photovoltaic cells and improve overall power output. Data has shown that modules coated with the 3M Anti-Soiling Liquid generate five to ten % more energy than uncoated modules. Designed for use during regular cleaning and maintenance operations, the liquid is easily applied with hand tools, is water-based, and is safe for both the environment and for workers with recommended application techniques. First Solar has set another world record for cadmium-telluride (CdTe) photovoltaic (PV) module conversion efficiency, achieving a record 16.1 % total area module efficiency in tests confirmed by the U.S. Department of Energy's National Renewable Energy Laboratory (NREL). The new record is a substantial increase over the prior record of 14.4 % efficiency, which the Company set in January 2012. Separately, First Solar also set a record for CdTe open circuit voltage (VOC), a critical parameter for PV performance, reaching 903.2 millivolts (mV) in NREL-certified testing. This new record marks the first substantial increase in CdTe VOC in over a decade of international R&D. The new records come just six weeks after First Solar announced a new world record for CdTe solar cell efficiency of 18.7 %. First Solar Inc. is living up to its name this year, with the No.1-ranked company expected in 2013 to become the first engineering, procurement and construction (EPC) firm ever to install 1 gigawatt worth of solar or photovoltaic (PV) power systems in a single year. The U.S.-based company is forecast to install 1.1 gigawatts (GW) of solar systems in 2013, more than double the 516 megawatts (MW) in 2012, according to information and analytics provider IHS (NYSE: IHS). This high rate of growth will allow First Solar to maintain its leadership in the EPC business for the year, despite even faster growth from Chinese rivals, No. 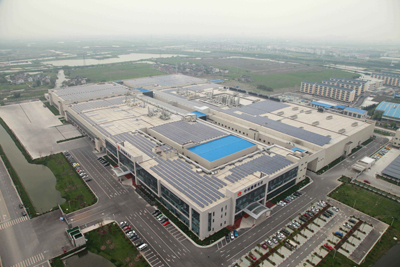 2 China Power Investment Corp. (CPIC) and third-ranked GD solar. EPCs, sometimes called system integrators, are vertically integrated contractors that build large-scale solar projects. Companies like First Solar are capable of a full range of installation tasks, including designing installation projects, procuring materials and building assignments. First Solar and a number of companies build projects developed in-house, generating revenue from the sale of completed PV power plants. Others focus on EPC for third-party developers, sometimes in combination with in-house development. First Solar's growth is built on its strategy to cultivate a pipeline of PV projects, in which it takes on major undertakings, sells them to other firms and then uses the proceeds to buy other large-scale installations. For example, First Solar in May announced the sale of the Campo Verde Solar Project, which is under construction in Southern California. Campo Verde will have a nameplate capacity of 139 MW of alternating current (MWac) when it is completed at the end of 2013. With the money it made from the sale, First Solar expanded its pipeline with the acquisition of three other projects under development with a total capacity of 260 MWac, due for completion by the end of 2015. In January, First Solar took a major step toward expanding its business outside the United States when it acquired Chilean PV developer Solar Chile and its early-stage 1.5 GW project. bSolar is a producer of bifacial photovoltaic (PV) crystalline silicon solar cells that provide 25% and beyond more electricity per cell at a standard cell production cost, lowering the LCOE, doubling the PV project IRR and cutting its payback time. bSolar's bifacial cell delivers industry leading equivalent cell efficiency with over 21% today and a target of over 24% in the near future. bSolar's cell is the best solution for flat rooftop and ground installations, as well as for PV trackers, sound barriers, car ports, facades and some forms of BIPV. bSolar manufactures its bifacial high-performance, high-quality, mono c-si cells in its 30 MWp/year plant in Heilbronn, Germany and is on track with a four-year target of reaching a bifacial cell production capacity of 500 MWp/year worldwide. Standard photovoltaic cells only harvest energy from a single surface – the side facing the sun. Israeli startup bSolar has found a way to improve upon this unidirectional design with a double-sided solar cell that is able to produce up to 50% more energy. The trick to bSolar's bifacial design lies in the cells' boron "back surface field", which is used instead of opaque aluminum backing – this enables the potent monocrystalline silicon photovoltaic cells to capture light reflected by rooftops, clouds, the earth, and the atmosphere. While dual-sided solar cells have been developed in the past, bSolar claims that their bifacial solar cells are more powerful, more efficient, and cheaper to produce. The company engineered monocrystalline silicon wafers to collect light from both sides of the solar cell and encased them with a boron "back surface field", which increases the cells' efficiency and durability. bSolar says that their design boosts electricity generation by 10-30% on flat surfaces, and by 30-50% on vertical installations such as fences and highway sound barriers. So far response to bSolar's bifacial photovoltaics has been strong – with many solar panel manufacturers interested in the technology. MEI's FlashDry is a unique rapid drying process that is capable of drying all form factors of semiconductor solar and metal grade polysilicon in minutes with significantly less energy use less material damage and complete drying. 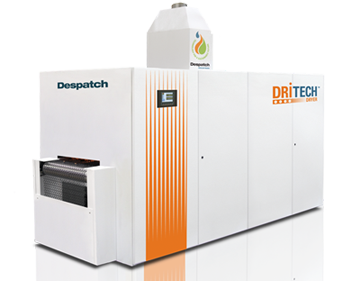 Flash Dry solves a vexing problem for materials processing how to completely dry polysilicon without wasting energy time and creating additional contaminants. Extremely fine form factors of poysilicon such as slurries muds sands and fines have been considered nearly impossible to dry on a production basis. Lab methods such as heated trays ovens and vacuum chambers where time-to-dry is irrelevant can't compete on a production basis. FlashDry is more than ten times faster than these archaic methods when used on polysilicon muds sands and fines. It can even dry polysilicon slabs placed face-to-face where the surface to be dried is completely occluded. FlashDry is a product based on a unique process model. This model allows the FlashDry process to remove the optimum amount of water through a mechanical coalescence process followed by a vacuum evaporation process. By using MEI's unique process model FlashDry is able to completely remove all of the water present in a variety of form factors of polysilicon from chunks and slabs to muds and fines in the shortest possible time. PowerTrackTM is a software solution providing energy management services to gather data from various sources. PowerTrack is designed from the ground up to handle a virtually unlimited number of sites, allowing you to organize your portfolio to match your business environment. It securely stores the data, and presents it in a way that allows for easy analysis and understanding. With PowerTrack, you can react to underperforming zones with performance modelling based on actual weather, sun or wind conditions for one or multiple sites. In addition, the system generates alerts and integrates with back office functions and public facing displays. With PowerTrack , you know how all parts of your energy portfolio are doing. With standard and customizable dashboards, you can view one or multiple sites, giving you the most complete look at your investment. It gives you the big picture on your investment and still have the ability to scrutinize the smallest details so you can maximize the return on your renewable energy investment. 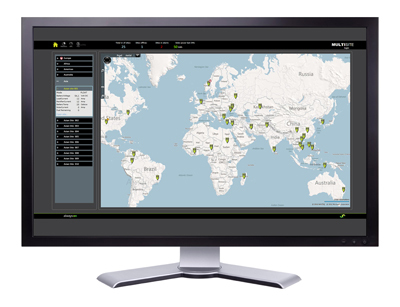 MultiSite Monitor (MSM) tracks the energy performance and status of all your sites. Access performance data that can be used to evaluate investments in hybrid DC power system and for marketing of site fleet's reduced carbon emission. Instant site status makes MultiSite Minotor the 1st line site maintenance tool; whenever there is a site in alarm, it is easily seen in the map, the list and top bar. One click in the site's details view will open the site's webpages in a new tab for further investigation of the alarm. The MultiSite Monitor server polls all connected sites for data using JSON protocol over http port 80. This transmission is not encrypted and suitable inside customer backbone network. If sites are to be connected through the open internet, IPsec encryption is recommended. Monitoring clients and administrator only needs access to the MultiSite Monitor server webpages. Service clients also need access directly to the sites to reach their internal webpages for configuration and details about alarms. Several energy sources can be utilized for feeding the DC load and charging the batteries; AC from mains or generator, and renewable source as wind and solar. The hybrid site controller logs energy produced by the various sources. 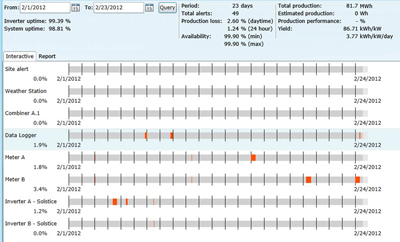 The energy logs, key parameters and status are sent to the MultiSite Monitor server. 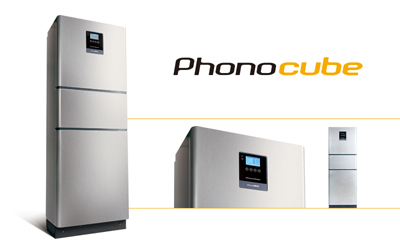 Phonocube is an energy management unit that is suitable for both new and existing PV systems. 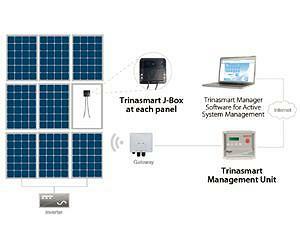 It combines the inverter batteries and the PV system into one compact system. Phonocube helps PV system owners to use PV electricity not only during sunlight hours but also at times of less light. Electricity produced by the PV system can be consumed directly stored in the batteries or fed into the public grid. Phonocube ensures self-consumption is prioritised Phonocube presents you not only with an essential product but with an energy management solution. You will notice nothing different except the reduction in your electricity bills. In 3-phase grid such as Germany if there is more energy demand on 1 phase the existing similar product will enhance the output power for all 3 phases which is not economical. Thanks to Phono Solar DPT technology when faced with the same situation Phonocube will only enhance the output power for the phase in extra energy demand and keep the other 2 phases' output power static which is not only more economical but also it prolongs battery lifetime. 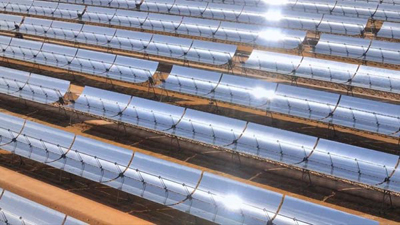 SolarReserve's concentrated solar thermal power (CSP) plants utilize the world's leading solar thermal technology which features integrated energy storage. This revolutionary technology which solves the problem of intermittent renewable energy generation is unparalleled in the industry. With inherent large-scale energy storage, SolarReserve's CSP plants operate just like a conventional power generator such as coal, natural gas and nuclear plants, providing reliable, predictable energy on-demand. But unlike conventional fossil fuel generators, SolarReserve's CSP plants are not only completely emissions free, but also have a limitless and free fuel source – the sun. 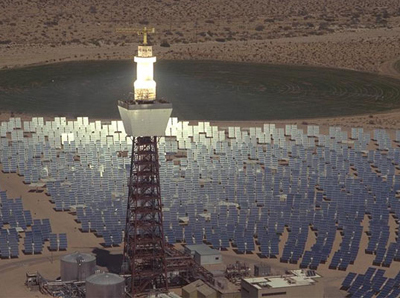 SolarReserve's solar power tower technology generates power from sunlight by focusing the sun's thermal energy utilizing thousands of sun-tracking mirrors (called heliostats) onto a central receiver that sits atop a tower. Liquid molten salt is used to both capture the sun's thermal energy and then store the energy until electricity is needed. The molten salt is pumped from the "cold" tank at 500 degrees Fahrenheit up to the top of the tower where it is circulated through the receiver to collect the sun's thermal energy. The "hot" salt at 1050 degrees Fahrenheit is then pumped back down the tower to be stored in the insulated "hot" storage tank where it is reserved until electricity is needed. When power is needed the hot salt is sent to a heat exchanger to produce steam which in turn drives a standard steam turbine electrical generator. The cooled molten salt is then pumped back to the "cold" tank where it is stored, ready to be reheated by the sun and used again as part of a continuous closed loop. The system is completely zero-emissions and requires no fossil fuels at all. A robust and diverse energy portfolio is critical to solving global energy security, economic and environmental challenges. And solar is a strong part of the energy mix that will reduce reliance on finite sources for power generation. However, electricity from traditional solar technologies is intermittent and unreliable which puts a strain on the grid and requires back up conventional generators using fossil fuel to firm up the electricity generation. SolarReserve has solved this problem. With its use of integrated energy storage SolarReserve's plants provide firm reliable zero-emissions electricity on-demand day or night whether or not the sun is shining. SolarReserve is deploying breakthrough technology to efficiently and cost effectively store energy from the sun so electricity can be dispatchable to meet demand whenever needed, day or night. SolarReserve's technology captures and stores the sun's thermal energy and operates on demand just like conventional coal natural gas or nuclear power plants but without the release of harmful emissions or hazardous wastes associated with conventional power plant technology. SolarReserve was formed to solve two of the fundamental barriers of renewable energy: scalability and dispatchability, through the use of integrated energy storage. 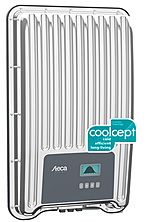 The award winning coolcept series has a new addition, the coolcept-x outdoor version. 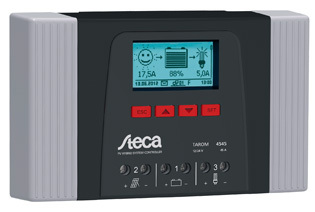 Based on the same connection principle the inverters achieve the best efficiency on the market with a peak efficiency of 98.6%. High efficiency means lower energy losses resulting in lower temperatures of the electronic components. This is a prerequisite for the longevity of the coolcept- and coolcept-x inverters and also for maximum yields in the PV system as a whole. 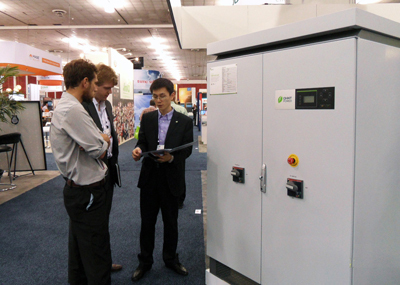 The low temperature inside the grid inverter greatly reduces the cooling costs. The ageing process of the components is also significantly slowed down. This extends the total service life of the device and also reduces the risk of system malfunctions. The especially light construction makes the installation of the devices more cost-effective and their transport significantly more environmentally-friendly. The use of proven standard components and the absence of expensive cooling systems allow the grid inverter to be offered on the market at greatly lower price than competing products. Cost-efficient production of the series devices was already taken into consideration when developing the device. A new feature is the robust designer casing made of stainless steel with IP 65 protection against dirt and water. The coolcept-x devices will already be equipped with the improved Internet-ready communication module from this summer onwards. This module offers a complete data logger produced as a standard component with a free web portal. The portal is entered via a plug & play installation. The SCHMID Group considers itself well prepared for today's requirements of the solar cell manufacturers in the PV market maintaining PV producers are willing to invest, but only in highly efficient technology. SCHMID Group believes that investing in new equipment, enabling the production of high-performance solar cells with an efficiency of more than 20% is critical. For turnkey solutions they guarantee 18% efficiency in the production of multi-crystalline cells, and 20% for mono-crystalline cells. With regard to the PERC production process SCHMID is the only equipment manufacturer to offer a complete process from a single source, the company says. 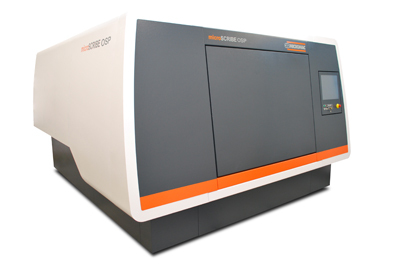 SCHMID's PERC portfolio ranges from rear side cleaning and APCVD coating up to laser opening of the coated rear side. All systems can be easily integrated into already existing production lines and offer the lowest cost in the market. According to the calculations of the SCHMID Group application of the required passivation layers and covering layers with the APCVD is about 40-50% cheaper than with alternative ALD or PECVD processes. PERC cells consist of crystalline silicon. For rear side passivation a layer of aluminum oxide is deposited on the base material by means of APCVD. The backside coating is completed by two covering layers, also produced by the APCVD. Depending on the wafer material the PERC cells reach average efficiency values of 20%-20.5% on Cz and 18%-18.5% on mc-Si, when applying the SCHMID process. SCHMID's APCVD coating system is the core equipment for PERC and has proved to be outstandingly reliable. Nearly one hundred APCVDs are successfully in industry use since many years for various applications. With this coating system SCHMID has already reached several PERC efficiency records. 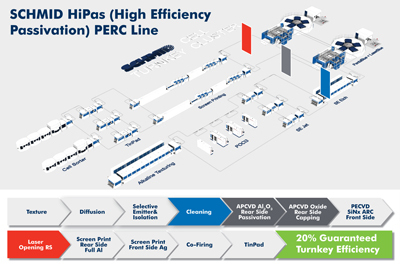 PERC cells are PV cells out of crystalline silicon with a selectively optimized emitter layer and a rear side passivation. Spire Corporation is a USA based, global solar company providing turnkey solar module, cell and thin film factories and solutions as well as individual capital manufacturing equipment to feed the rapid expansion in the market worldwide. For over 35 years, Spire's turnkey factory solutions have been comprehensive and allowed new and experienced customers to rapidly enter and ramp to full production without concern for start up or ramp difficulties. Applying its expertise in materials technologies across all product lines, Spire has a rich heritage of utilizing science and research to develop leading edge products that generate renewable energy and deliver advanced solutions to businesses around the world. Spire offers a comprehensive package. The Turnkey Approach includes state-of-the art equipment and key technical advice that ensures the workforce is expertly trained and the final products pass the rigorous certification process. In addition, Spire provides finished designs – including facility planning and layout, factory automation, and module design services – and complete material and vendor lists. Spire also passes on the critical embedded process knowledge that allows you to produce products of the highest quality and sell into the most lucrative markets. Spire's experience is based in years of active research and includes expertise in module production solutions for crystalline and thin film modules, solar cell production, and production of concentrator cells at our own Gallium Arsenide foundry. Classical thin-film structuring requires three scribing steps between the vacuum depositions of the individual functional layers. This results in large dead zones, extensive cleaning procedures, reduced layer and interface quality, longer throughput times and yield losses. The dead zones: defined by the full width of the three typical structuring lines, considerably decreases module efficiency. Due to inaccuracies between different scribing tables, tolerances have to be implemented, which further enhance the dead zones and directly lead to efficiency losses. Furthermore due to the scribing steps, considerable efforts have to be incurred for bringing substrates in and out of vacuum after each thin-film deposition. 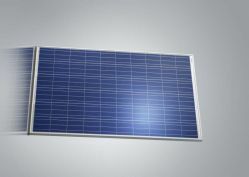 It is the first production equipment worldwide that can conduct the integrated series-connection of a thin- film solar module on one single platform and in one single production step. 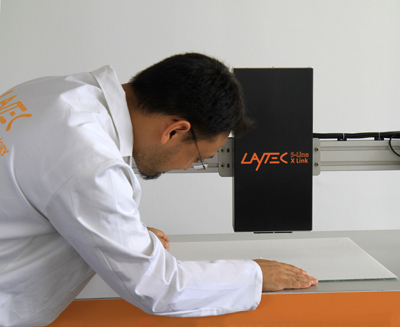 LayTec's metrology system X Link is a metrology system for non-destructive evaluation of the EVA (ethylene vinyl acetate) cross-linking level immediately after lamination. LayTec developed the in-line device for monitoring the degree of cross-linking in EVA laminates in cooperation with Fraunhofer USA. The method is based on the measurement of physical properties associated with the level of cross-linking. The tool can be integrated into every solar module production line and provides for long-term process stability, high yields, 100 % quality and low production costs. Benefits include: eliminated scrapping of laminates, easy integration in existing lines, 2D product quality control, process control of lamination, multi-point measurement capability and sturdy design for industrial application. 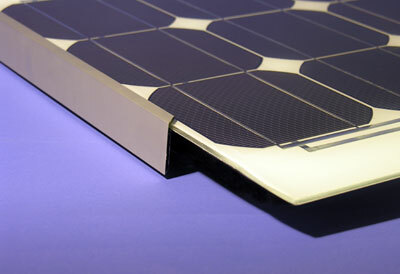 The lamination process is the most critical production step of module manufacturing. 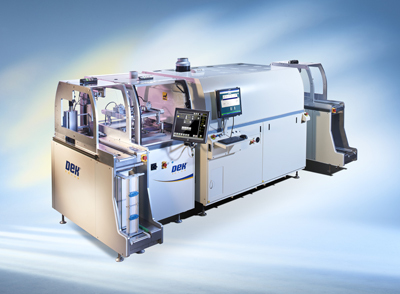 Currently a major issue why modules fail in the field is due to bad EVA cross-linking caused by difficulties during the vacuum lamination process itself or unstable EVA foil materials. This system replaces the common and coarse gel content test. 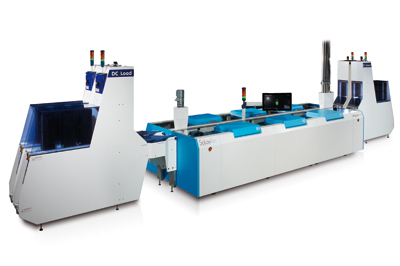 The LayTec X Link system ensures a perfect lamination process which is critical to high-quality modules as cross-linking quality and uniformity impact is essential in terms of quality over time. The atmospheric deposition process developed and patented by Calyxo offers advantages compared to some other PV processes. The module glasses are inserted in the glass oven and heated up to process temperature. The CdTe coating itself takes place via a cadmium telluride gas stream that deposits itself on the surface of the module glass by changing from a gaseous state to a solid (desublimation).The coated module glass is cooled in a controlled manner and removed from the glass oven for further processing. How is the gas stream created? 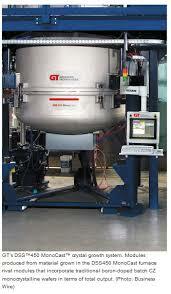 Storage and provision of the coating materials (cadmium telluride powder) are separated from the deposition unit. A continuous supply of materials is ensured from outside of the deposition unit. A carrier gas (shielding gas) of the highest purity is used for transporting the semiconductor materials. Heating and evaporation of the gas mixture with subsequent deposition onto module glass takes place in the deposition unit we developed and patented. What are the advantages of the Calyxo coating process? Deposition rates of a few µm/min semiconductor thicknesses – orders of magnitude faster than other vacuum deposition processes. The conveyor belt never rests since coating takes place as a continuous process and the whole process takes place in atmospheric conditions. SolarSpec™ Smart Junction Box is making it easy for manufacturers of solar photovoltaic (PV) panels to provide their products with module-embedded safety and monitoring functions, as well as convenient, safe and dependable connection facilities. 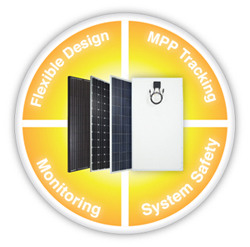 The modular concept allows maximum flexibility and easy upgrade of PV-panel functionality, since the electronic PCB always resides in the removable Junction Box cover, this smarter system not only facilitates lean solar manufacturing processes on a manual or automated assembly line, but also ensures easy access to key components should repair or replacement is ever required. The Smart Junction Box is based on the original two-part SolarSpec™ Junction Box from Molex featuring a base attached directly to the solar PV panel and a removable cover assembly. Functionalities include system safety, shut-off and arc detection, security monitoring and theft protection, performance tracking on output levels and panel efficiencies, remote diagnostics and power optimization. SolarSpec Junction Boxes can be supplied with optional Solder Charge™ technology for use in conjunction with high-speed assembly processes that provide consistent quality for every termination. A locking mechanism requiring a specialized tool to release secures the top cover to the base, providing total protection against accidental contact with live parts. With 98.0% weighted CEC efficiency, the inverters represent the highest efficient of any inverter in the 3-phase category. Combined with the innovative Power Optimizers from SolarEdge, they can enable a 1000 Vdc system to be built with 600 Vdc modules. The SolarEdge system can be divided into two areas: a 600Vdc area where modules and wiring from the modules to the power optimizers see only lower voltage, and a 1000Vdc area that includes the power optimizers, the wiring and other components between the power optimizers and the inverter, and the inverter. This makes system component selection much simpler as 600 V rated modules, not only 1000 V rated modules, can be used in the system. By controlling the Power Optimizers to maintain a fixed voltage input, and by enabling 1000 Vdc capability, the SolarEdge inverter enables increased string sizing. Where a traditional inverter is limited by module voltage, the SolarEdge solution controls the voltage removing it as a limitation. The string length for SolarEdge is based on power and not voltage, meaning string lengths that are 2-3 times longer than with traditional inverters. They are the lightest inverters in their class weighing in at less than 80 lbs – almost the same weight as a 72-cell cSi module. They are approximately 1/3 the volume as well, opening up many options for placement of the inverter. The medium power series of grid-tied, transformerless inverters help to accelerate the use of 1000Vdc and three phase string architecture for commercial and small ground mount utility applications. A UL approved, cost effective alternative to central inverters enabling BoS cost savings, high harvest performance and modular design building blocks. These models provide up to 98.2% conversion efficiency and wide operating window of 400-900Vdc and dual MPPT's for maximum cash-flow generation. Envision Solar's SolarTree® structure is the highest quality fastest deployed and most attractive turnkey photovoltaic parking shade system in the industry. The SolarTree® shades six to eight standard parking spaces while simultaneously producing enough clean renewable energy to fully charge six electric vehicles each day enabling them to become truly emissions free. The integrated EnvisionTrak™ technology a hybrid multi-axis design allows the entire PV canopy to track the sun whilst consistently remain on a 15° tilt to achieve optimal energy output yet not restrict the traffic flow in drive aisles of parking lots or parking spaces. In addition to it's highly functional purpose EnvisionTrak™ adds to the aesthetic appeal of commercial real estate by changing it's appearance from dawn to dusk as the PV panels reposition themselves every nine minutes a parking lot will never look the same to a customer when they enter as to when they leave. Envision Solar's Solar Tree® arrays are the ideal combination of form function and sustainability providing the perfect solution to creating sustainable distinguished real estate. The Solar Tree® structure exclusively addresses the failing of fixed PV panel usage which achieves optimal energy production during peak hours only whereas the Solar Tree® array tracks the sun across the sky throughout the day. Parking lots are under-utilized wasted real estate for property owners but the Solar Tree® array adds value in multiple forms. Light pollution lack of lighting and electricity used to run lighting are all a hindrance for businesses but the Solar Tree® array offers a unique solution. Electric vehicles are a great alternative form of transportation but charging from the grid means more burning of fossil fuels. However with Envision's CleanCharge™ technology EV drivers have the option of a renewable solution. The Solar Tree® array solves the problem of low energy output with our revolutionary patented EnvisionTrak™ technology. Parking lots are made beautiful by advertising the use of solar power and the product design enables it to enhance any property. Environmental challenges are addressed through the production of clean renewable energy reducing use of electricity generated by the burning of fossil fuels. With the integration of electric vehicle charging stations the Solar Tree® array enables vehicles to become truly emissions free. It's Drag & Drop™ capabilities offer fast installation and keeps disruption to a minimum. 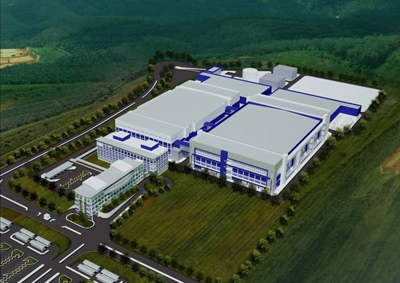 Talesun Solar operates the world's largest, fully automated solar manufacturing facility (2,260,000 square feet). Talesun produces high-quality crystalline photovoltaic (PV) modules with industry-leading precision and consistency by automating nearly every aspect of production and streamlining processes that traditionally fell to skilled factory workers. As the largest, fully automated solar manufacturing facility, it demonstrates one model for successful long-term solar manufacturing focused on manufacturing excellence. The solar industry is shifting from simply selling the lowest-priced product to selling a product built with attention to quality control and production processes that will result in long-term performance reliability and durability. Due to automation, Talesun Solar introduces meticulous precision and a systematic production process that consistently delivers a high-quality product to its customers. Human error is dramatically reduced and as a result a superior balance is achieved between delivering high-quality long-term performance modules and competitive market pricing. Talesun's produces such consistent quality that modules are validated by the industry's highest standards set by International Electrotechnical Committee (IEC) and the most rigorous certifications tests by Underwriters Laboratories (for example Salt Mist Severity Levels 1 and 6). Global certifications like the VDE Quality Test that Talesun modules received in May 2012 reiterate the validation from IEC and Underwriters. Only a few solar manufacturers worldwide have earned this level of excellence. Developed by the VDE Institute in partnership with Fraunhofer-ISE, the VDE is one of the most stringent certifications available, well beyond existing standards. Among its requirements are increased sample sizes, longer testing period's time to assess durability, and industry best practices of quarterly testing. Talesun's manufacturing is also validated by recognized leading third parties in the industry. BEW Engineering a worldwide leader in evaluating solar engineering standards visited Talesun's manufacturing facility and reported that, "The quality system implemented at Talesun's cell and module factory is best in class". By taking the fully automated approach Talesun operates at the nexus of higher quality and competitive pricing backed by the industry's highest third-party certifications and validators. Our process dramatically reduces human error and harnesses the ability of robotics to cost-efficiently and precisely construct every panel for consistent and reliable quality. Barefoot College, since 1989, has been harnessing the sun's energy to help rural communities thrive through applying solar energy solutions in four critical areas of village life: 1) solar electrification of 1000+ villages, 2) hot water, 3) solar cookers, and 4) fresh drinking water through solar powered desalination. Each of the solar electrification solutions pioneered in rural, remote, non-electrified villages by Barefoot College has proved that both illiterate and semi-literate men and women can fabricate, install, use, repair and maintain sophisticated solar units through basic knowledge share and intense hands-on practical training. The Barefoot College has harnessed solar energy not only to provide light but also to create employment for the unemployable, to boost income for the poor, to save the environment by reducing carbon emission and not cutting trees, and most importantly, to provide self-reliant solutions within village life. For the solar electrification of villages, Barefoot College annually trains about 100 grandmothers from India and 80 grandmothers from international rural villages located in the least developed countries as per the UN. The grandmothers complete a comprehensive 6 month solar engineering training program at Barefoot College campus in India where they learn how to light up solar home units, solar lamps, and charge controllers. Upon completion of training, the grandmothers return to their village to electrify upto 250 households with solar lighting units and assume the responsibility of repair and maintenance for a minimum of 5 years. They play a key role in sustaining and replicating solar technology in rural communities by training other women and managing the finances of the solar workshop. The solar electrification program benefits the villages through save money on kerosene and wood and increasing the time spent on education and livelihood. Barefoot College's solar water heater solution provides rural communities access to a smoke free and eco-friendly source of heating water as well as to generate employment for unemployed rural youth. The solar water heater engineers are trained to fabricate, install, repair and maintain two varieties of solar heaters, oil-based and non oil-based, that can store upto 300 liters of water. More than 70 solar water heaters have been manufactured and are benefiting hundreds of people living in rural, remote villages in 8 states of India. The 2.5 square metre, 130kg parabolic solar cookers used to cook food are fabricated, installed and maintained to precise measurements by illiterate and semi-literate women. The eco-friendly solar cookers used in Indian villages feed more than 400 people every day. The solar powered desalination plant setup by Barefoot College, the first of its kind in India, is a joint partnership with the scientific community that produces 600 litres of water per hour, for 6 hours every day. Bennu Solar is a specialized consulting firm, focused on the multi-billion dollar energy needs in poor rural areas of the developing world. Currently, low-income villagers are paying for energy over ten times the price than people in developed countries pay, and yet these people are under-served. Knowledge — on available funding, business models and successful practices by taking advantage of our free resources database. Support: Free to start-ups and can help in planning energy poverty elevating programs. Quality solar products at lower costs, take advantage of our procurement support. Bennu Solar was established in 2006, and is managed by Yotam Ariel, their goal: reach 1 billion villagers by the year 2014. 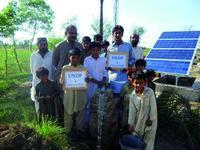 Phaesun GmbH installed 200 solar water pumping systems in 12 districts in Pakistan. The systems were successfully put into operation together with the Pakistani partner Izhar Energy by December 2012 in the district of Sukkur. The project has been initiated and financed by the United Nations Development Programme UNDP to counteract the destructive tidal flood in Pakistan in the summer of 2010. Thousands of families will benefit from the project that secures the water supply for drinking water, irrigation and livestock farming. The people in Pakistan still suffer from the devastating consequences of the flood disaster in 2010: Thousands of people lost their lives, 6 million people urgently needed humanitarian aid, the infrastructure was severely damaged in many parts of the country. Even the water supply was disastrous in many places. Clean drinking water was often only available after having covered long distances. Organised water supply for agriculture and livestock farming was often not existent in many places. The UNDP-project aims at a sustainable water supply for local communities by means of renewable energies. In twelve districts of Pakistan, local communities have been identified where the water supply was almost completely disrupted. The 200 solar water pumping systems have been individually sized according to the needs on site such as water amount and pumping head and were installed from November 2011 until December 2012. The systems use pumps of the manufacturer Grundfos which are operated with solar modules between 400 and 700 watts. Russom Semere, managing engineer at Phaesun reports: It was an enormous logistical effort to realise that project. The infrastructure in many regions of Pakistan has not yet been rebuilt. The components often had to be taken to their point of destination with the help of donkey carts and boats. The project could be realised in the first place due to the cooperation with the local partner Izhar Energy and the UNDP members on the spot!" The project has a sustainable effect on the development of the affected regions. The UNDP initiated and financed the project; Phaesun sized the systems, prepared and supplied the components. The logistics and installation on site was organised together with the local partner Izhar Energy. ISOFOTON has successfully implemented and developed a new HCPV plant in Santa Maria de Licodia Sicily, an area with high levels of solar energy radiation which makes it ideal for developing this type of technology. The plant has a nominal power of 100kWp and will generate 210 MWh annually. This plant is a breakthrough for HCPV ISOFOTON technology in Italy and is one of the first plants of its kind to be installed in the country. The plant was installed in June 2012 and was successfully connected to the grid in July that same year. The connection process was carried out in compliance with IV Conto (Italian energy regulation) and ISOFOTON GEN2 technology was used. This technology is certified in compliance with IEC -62108 and has received favourable bankability reports which ensure that both the GEN-2 module and the two axle solar tracker were designed and manufactured in accordance with the highest standards. The ISOFOTON HCPV technology obtains energy by concentrating sunlight through an optical system onto high efficiency photovoltaic cells. The system obtains high energy production with a much lower semi-conductor surface than other solar technologies. Specifically, this technology converts sunlight into electrical energy with approximately 39% efficiency. The High Concentration Photovoltaic system has considerable advantages over other solar technologies. With its flexibility, (suitable for plants from 1 kWp up to several MWp) scalability (the power of a plant can be easily increased without having to develop new systems or procedures), environmental sustainability (impact is minimized, the land can be put to additional use and it does not consume water) or economic use of space (less land is required for its installation). In May 2012, a magnitude 5.9 earthquake hit the Emilia-Romagna region of Northern Italy, followed nine days later by a magnitude 5.8 earthquake. Together, the two earthquakes destroyed property and infrastructure, impacted the region's economy and devastated lives. In response to the earthquake, Upsolar sponsored a 384 kW solar PV project in the region to bring power to the affected community. The Upsolar system will satisfy the electricity needs of approximately 130 families for the next 25 years, and will generate money that will go toward reconstruction for the next 20 years. 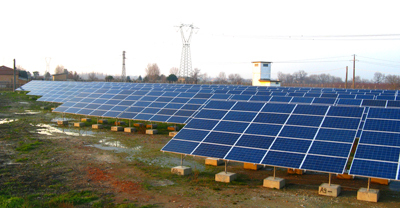 Upsolar donated two solar PV systems that will bring aid to the affected families in the Emilia-Romagna region. The 384 kW system – built as two 192 kW solar arrays – will satisfy the electricity needs of approximately 130 impacted families for the next 25 years. The systems will also generate money through Italy's fourth Conto Energia rates that will go toward regional reconstruction for the next 20 years, helping families rebuild their homes and communities. This pro bono solar initiative will contribute to the rebirth of the Northern Italian community, promoting clean energy, sustainable development and regional economic development for the next 20 years.